The adoption of the Vietnam - EU Free Trade Agreement (EVFTA) and the Bilateral Investment Protection Agreement, which may be enforced in late 2018 or early 2019, will allow commodities to be exported to the Europe more easily and more favourably, although they also raise concerns about implications of law enforcement on chemical in imports in the EU. Speaking at the seminar on “Solutions to EU Chemical Legislation Compliance”, Finnish Ambassador to Vietnam Kari Kahiluoto stressed that EVFTA will help boost trade, but it is not easy to meet technical standards in this market, including REACH (Registration, Evaluation, Authorisation and Restriction of Chemicals), which has been applied in the eurozone and in many countries around the world. REACH has become an international foundation and direction for chemicals and the use of chemicals. IREACH - the most stringent chemical and chemical safety legislation in the world to date - has been enacted and entered into force on June 1, 2007 to replace 40 EU chemicals laws. Particularly, the new regulation on the quantity of 1,000 tonnes per year for the first import to the EU market has come into force since May 2018. REACH includes Registration, Evaluation, Authorisation and Restriction of Chemicals. This rule is implemented in many stages in 10 years, with the compulsory declared list of products related to industry and consumer goods such as chemicals, dyes, prints, fabrics, yarn, apparel, footwear, toys, electronic products, household appliances, wooden furniture, cosmetics and aroma used in candles and paints. REACH is applied to merchandise exported to the EU, as the EU wants to make sure that human health and the environment are guaranteed by applying hazardous substance assessment methods without affecting its chemical circulation. However, this will lead to increased concerns for Vietnamese exporters doing business with the EU. 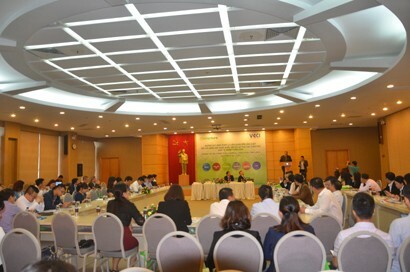 Mr Hoang Quang Phong, Vice President of the Vietnam Chamber of Commerce and Industry (VCCI), said that complicated REACH regulations affect most Vietnamese companies that export their products to the European market. “In fact, most producers of input materials and exported products engaged in footwear, leather, printing and dyeing industries use certain chemicals, but many of them do not know specific information about restricted or prohibited substances imported into the EU market,” he said. According to EVFTA, including REACH, substances used in garments and textiles must be reported and declared to the European Chemicals Agency based in Helsinki, Finland. The rule is applied if the concentration in products is 0.1 per cent or more per tonne, a tonne or more will be imported into the EU. Therefore, if EU law enforcement and customs authorities detect restricted substances in products that Vietnamese companies have not declared or have not registered, infringing companies will be excluded from this market, or even even fined or taken to court. In the face of this concern, Finnish Ambassador to Vietnam Kari Kahiluoto noted that exporters to the EU market must comply and modify and adapt to EU’s chemical standards, on the one hand, but meeting EU standards will bring practical benefits and bring them towards standard values of current supply chains, on the other hand. Concurring with this, Jani Maatta, CEO of Chementors Co., Ltd, recommended that exporters shipping goods to the EU should upgrade their management system of chemicals contained in their products, along with conducting further studies and obtaining in-depth knowledge about REACH, in order to meet REACH requirements. Manufacturers and importers have to also guarantee that their substances will not cause damage to human health and the environment, said Jani Maatta. VCCI Vice President Phong said, to benefit from EVFTA, providing companies doing business with the EU with expertise and experience on the implementation of REACH regulations is very necessary. Manufacturers of goods exported to the EU market must be aware of prohibited and restricted substances contained in products imported into the EU.